Kindergarten, Mrs. Keating and Miss Potenza’s split class. 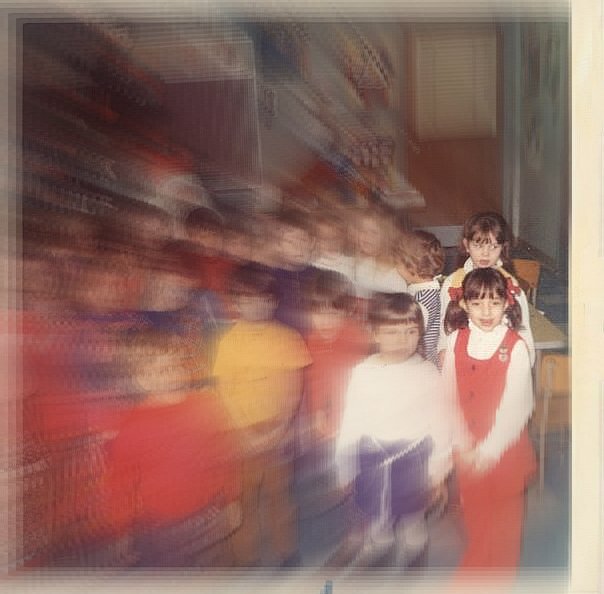 She is the cherubic, well-behaved one in the front with ladylike clasped hands; I am standing behind her, giving a five-year-old stinkeye to someone off camera. Some things never change. Please note that that may be the last time in my life I’ve worn yellow. Sparing the gory details (perhaps a violation of the rules of blogging but you know…some laundry doesn’t need to be aired), Mary Jo and her husband David were the steady hands that got me through a tremendous crisis, and they didn’t judge, they didn’t snark. They just supported, dealt with my meltdowns when they came, and got me safely to the next stage of my life. If that’s not friendship I don’t know what is. I can only hope to be so graceful to friends in need. You ARE that graceful to friends in need. Great Photo Challenge entry—you’ve once again gone Beyond Paisley! Great share Paisley, great friendship. Beautifully, beautifully, beautifully written! Very touching, you’re a great writer! Thank you so much. I’m delighted you enjoyed it! Sweet homage to your friend and her husband!